This Ramadan, One Nation will be providing aid in 18 countries across the globe. 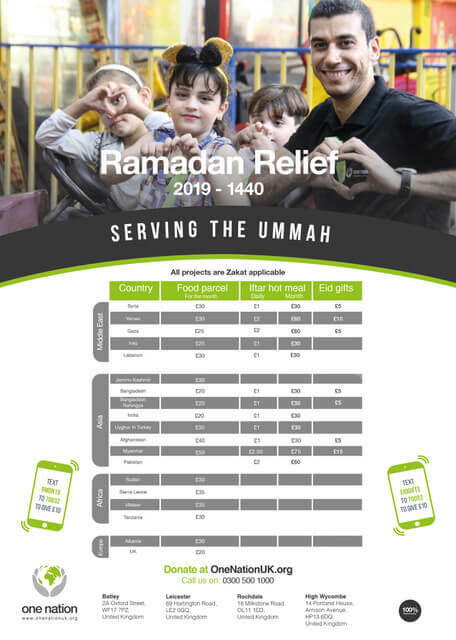 We need your support and donations to serve the ummah. With your assistance, we will be ensuring that the deprived and struggling will have enough to sustain their families throughout this blessed month. “He who feeds a fasting person will gain the same reward as he will, without decreasing from the fasting person’s rewards.” [Ahmad]. Donate your Zakat, Sadaqah and Lillah to this noble cause. Please support our Ramadan Relief appeal.